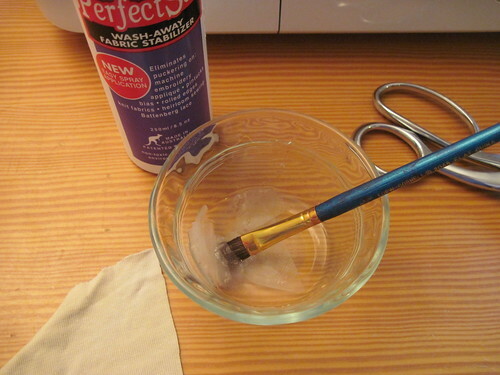 I promised a few people a little blog regarding sewing with knits; here goes. 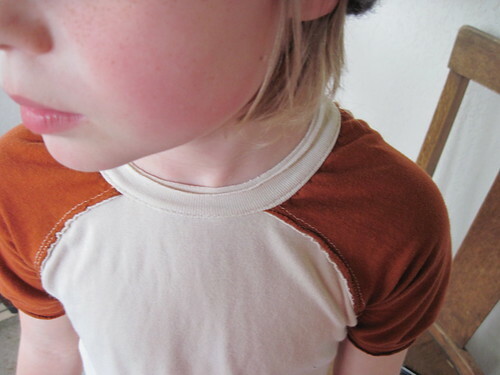 My daughter requested a shirt in “earthy” tones. I had just enough in my stash to make her one. 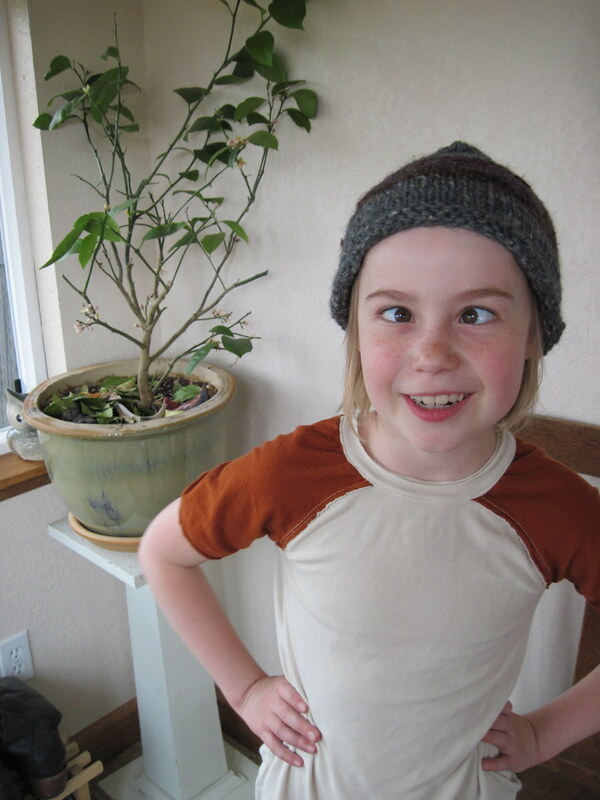 The natural-colorway was from a piece of organic bamboo yardage given to me by a friend; the brown was from a 100% organic cotton t-shirt I thrifted (I used most of the shirt to make a headband for my mother). 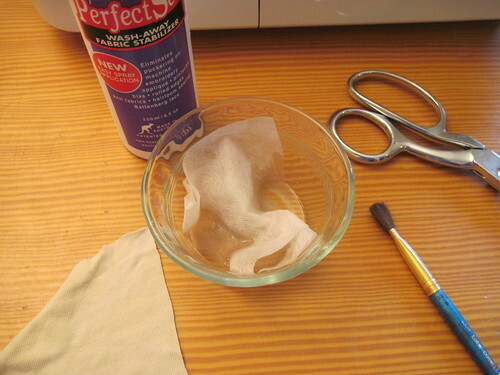 In both cases once I cut out the shirt pattern pieces I ended up with only a small portion scraps to compost. 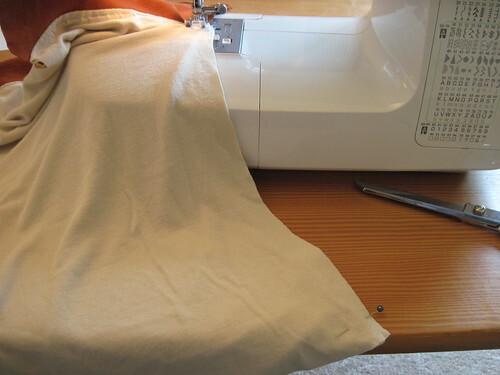 I love it that I use fabric so economically. 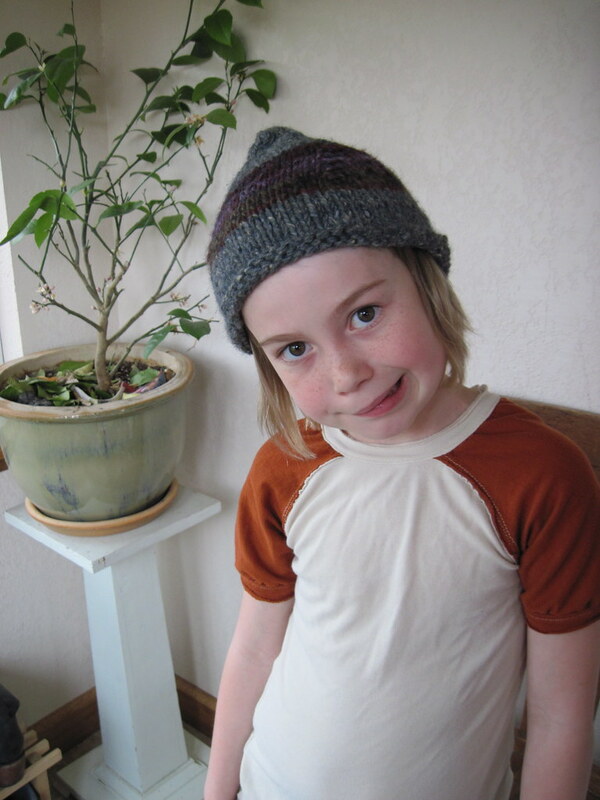 The pattern I’m demonstrating here is the Tea for Two from Patterns by Figgy’s (and while I’m at it – seriously? You could not find a couple of better people to help the beginning sewist achieve rugged yet stylish, boutique, unique home-sewn awesomeness!). 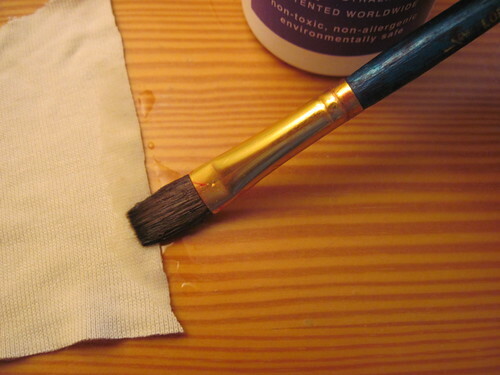 Regardless of whether you use this pattern or another, the techniques used here should benefit anyone attempting to home-sew a t-shirt. 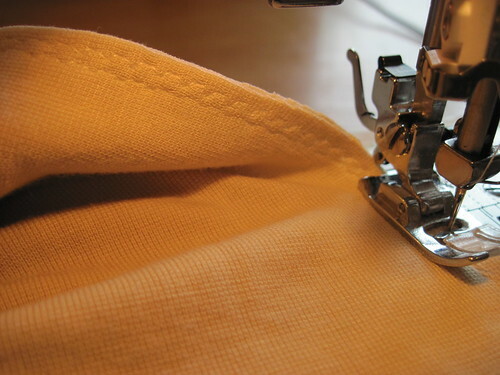 Which seams do you have to stabilize? Those that will be travelling across the feed dogs of the machines. 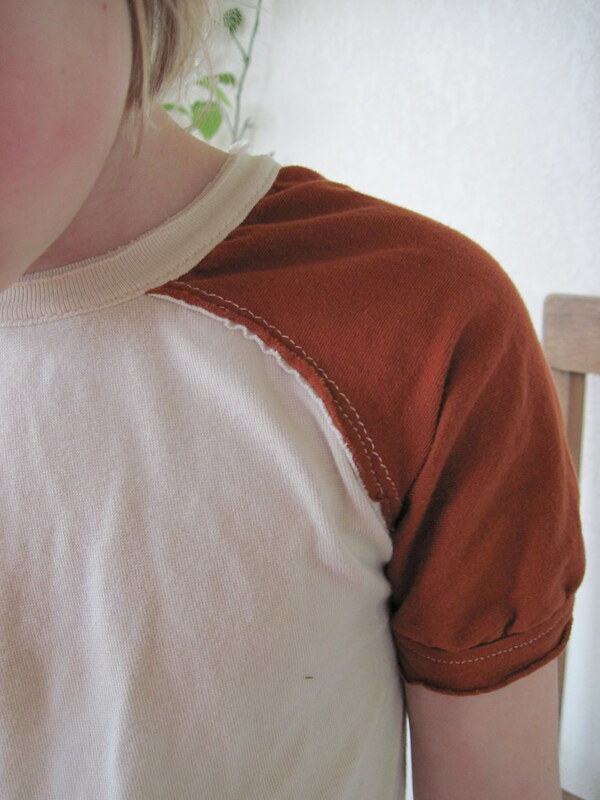 For this pattern, this means all edges except the sleeve and shirt hems (which remain unfinished). 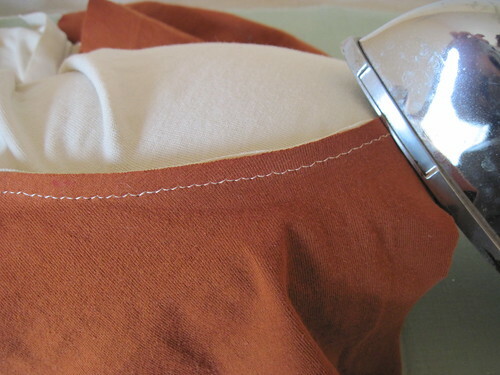 I stabilized the short ends of the neckband as well, given as a last step in this pattern the neckband edges have to be topstitched closed in a little rectangle and I figured, “Why not?”. 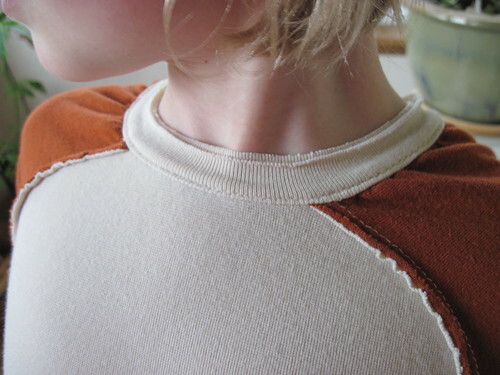 The neckband in general does not need to be stabilized as it is rarely against the machine (when you attach the band it will be the shirt bodice that travels across the machine surface) and it needs to stretch quite a bit to perform its function (which is to “snap back” after sewing and bring the shirt edge in to hug the neck). 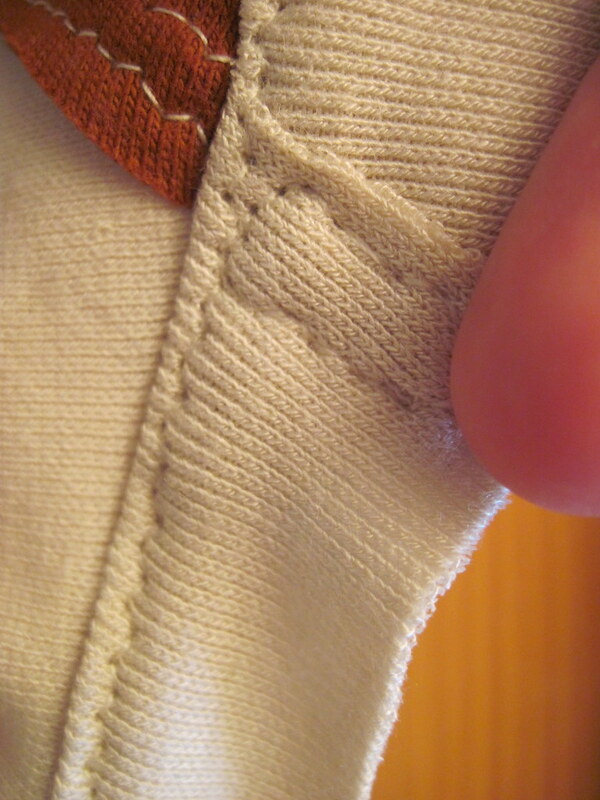 After attaching the sleeve strips, you press them together (hiding the raw edges of the sleeve end) and topstitch. Easy-peasy! 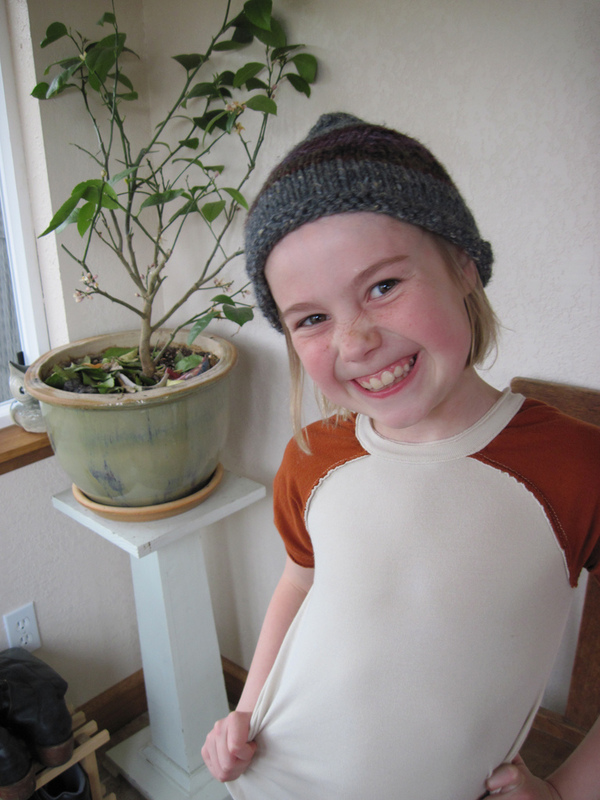 The neckline is probably the trickiest part of this particular pattern, but it is an ingenious little treatment that not only looks fabulous but is a lot less trouble than most self-finished necklines. 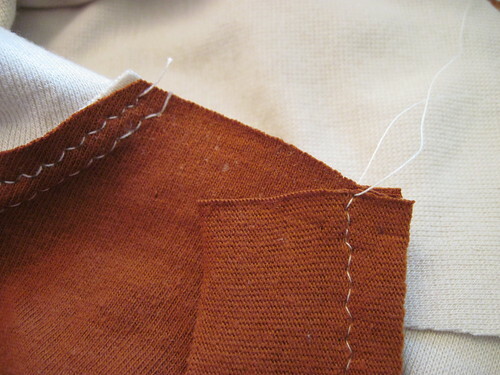 Two strips are sewn, one at a time, first to the outside of the garment than the inside. Both strips are simply overlapped at each short end. 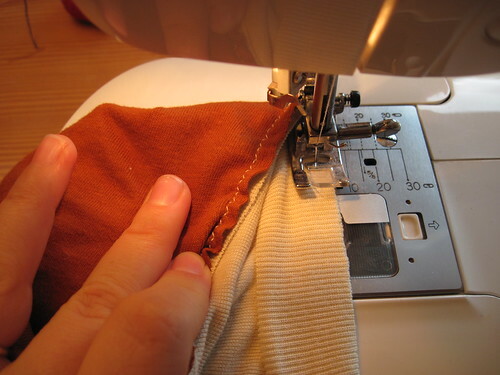 The outside strip is sewn at a slightly wider seam allowance. 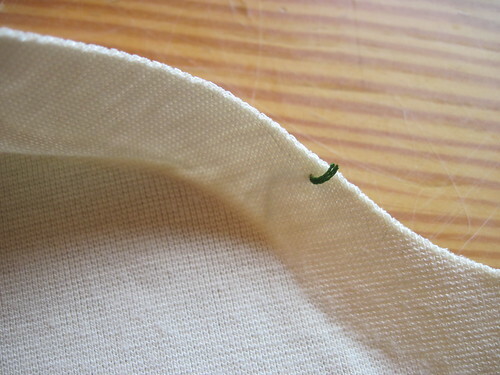 Thus when you press up both strips the seamline will cover itself. The only thing that remains is to sew a tiny rectangle, anchoring the overlapped ends of the neckband at the back-left shoulder. 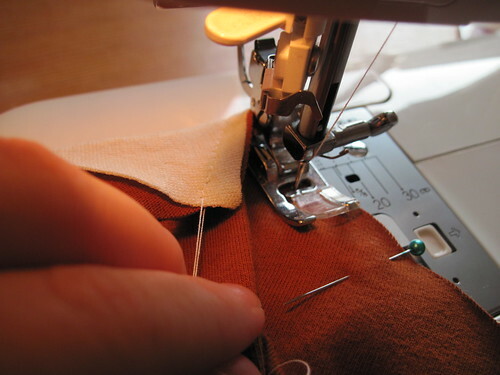 I always imagine your Beginner stitcher is alarmed at this point. The neckband of shirts is always so much smaller than the shirt opening! But, that’s the point. 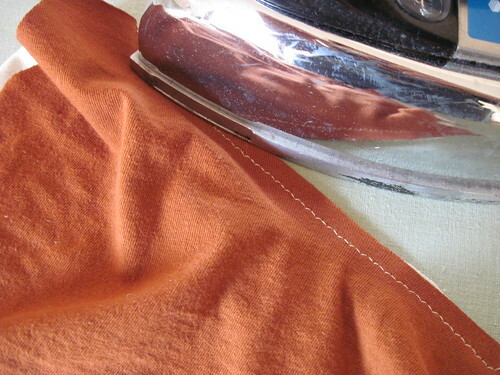 This strip, cut against the knit grain, will pull the shirt neckline in to lie flat on the body. 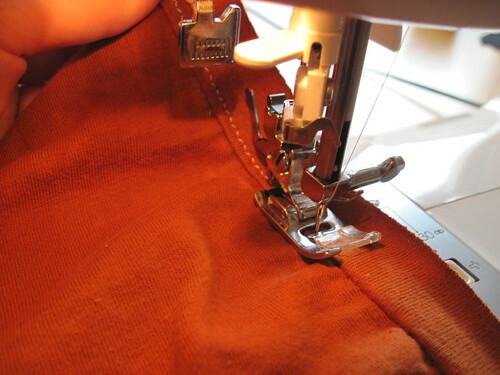 Again, you sew with the strip facing up and the shirt neckline against the machine. 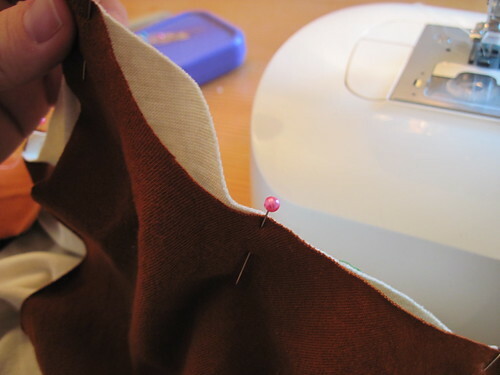 Carefully pin at a few places and stretch and the whole thing comes together like a dream. 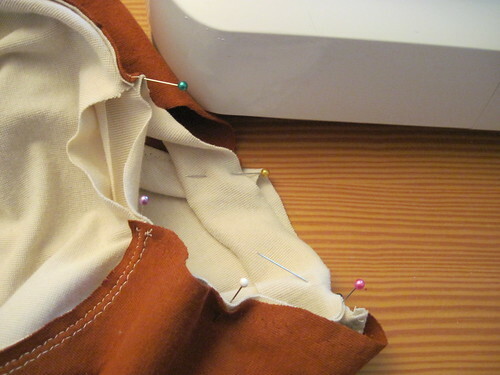 Here’s the best trick I know regarding topstitching: go slow! 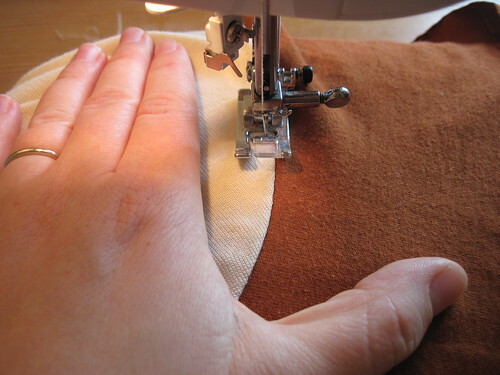 Very few of us make “perfect” topstitching but the slower you go, and the more you practice, the better things will look. You can see my Flickr tagset, including more details of construction, here. I dig this shirt! Thanks for the great tutorial and all the closeups.